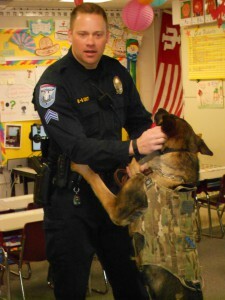 The students in Mrs. Harbert’s first grade class at Henry Burkhart elementary have been reading about how animals and people work together, so they invited Beech Grove K-9 Police Officer Jeff Bruner and his partner Kevin to visit. He talked to the students about what it takes for a dog to work as a police dog, the many jobs a police dog might have, and what the dog does when it’s not working. 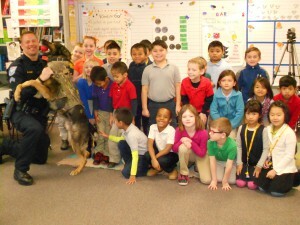 Students even got to meet his German Shepherd, Kevin, who has been working with Officer Bruner for eight years.